The Northern Territory (NT) is an important strategic location for defence. This industry continues to make a substantial contribution to the NT economy through direct and indirect employment and demand for local goods and services. The defence industry also generates economic activity through major operations and exercises held in the NT, along with major capital infrastructure projects, many of which engage local businesses. In 2017-18, total defence expenditure contributed 8.4% to the NT’s gross state product (GSP) or approximately $2.1 billion, in inflation‑adjusted terms. This reflects an increase of 4.2% compared to the previous year and remains above with the 10-year average defence expenditure of $1.9 billion (Chart 1). This increase was largely driven by a 23.0% increase in defence investment. Nationally, total defence expenditure accounted for 2.3% of Australia’s gross domestic product (GDP). Total national defence expenditure as a proportion of Australia’s GDP is expected to rise over the medium term. A significant portion of the increased defence expenditure is expected to occur in the NT, with a number of major investment projects commencing or planned in northern Australia as part of the Australian Government commitment to the 2016 Defence White Paper, which will further increase the sector's contribution to the NT GSP. The share of defence expenditure as a proportion of NT GSP has been trending upwards since the low of 6.9% in 2014-15, accounting for 8.4% in 2017-18, mainly related to an increase in defence investment (Chart 2). Defence expenditure in the NT as a proportion of total national defence expenditure represented 5.3% in 2017-18, slightly below the 10-year average of 5.5%. The 2016 Defence White Paper outlines a strategic plan for the ADF over the following decade. The paper describes the need for improvement in the capabilities of the ADF and includes a commitment to $195 billion over 10 years in spending on new equipment, infrastructure, information and communications technology, and resources, as well as plans for restructure and review of the Royal Australian Navy, the Royal Australian Air Force and the Australian Army, through increased personnel, investment, training, and joint initiatives with international defence forces. All elements of the Commonwealth’s defence investment are outlined in an Integrated Investment Program, published with the 2016 Defence White Paper. Both documents are available on the Commonwealth’s Department of Defence website. As highlighted in the 2016 Defence White Paper, defence major capital works projects will continue to make a significant contribution to economic growth in the NT. Expenditure for the NT included in the White Paper is estimated to be valued at about $8 billion from 2015-16 to 2024-25 (31.6% of total defence investment in Australia), and a further $12 billion between 2025-26 and 2035-36 (43.3% of total defence investment in Australia). As part of the cost-sharing negotiations for the Force Posture Initiatives, Australia and the United States (US) will be investing around $2 billion (Australian dollar terms) in new and upgrades to accommodation, training ranges and infrastructure in the NT, offering significant opportunities to local industries, as well as the ongoing operational costs of the initiative over the full 25-year life of the agreement. The associated infrastructure works will unlock many opportunities for a range of sectors and disciplines including construction, design, professional services, logistics, maintenance and transport. A growing number of defence and national security platforms (including aircraft, ship vessels and equipment), which are either based in or operate from the NT, will be replaced as part of the major national acquisition program currently underway. Current platforms in the NT such as the F-18 Hornet, Armidale Class Patrol Boat and Cape Class Patrol Boat will be replaced with new platforms, such as the F-35A Joint Strike Fighter as well as six of the twelve new offshore patrol vessels, which are proposed to be located in HMAS Coonawarra. Construction of the first two offshore patrol vessels will commence in Adelaide in late 2018, with the remaining ten to be built in Western Australia. The first boat is scheduled for delivery to the Department of Defence in late-2021 with the remaining 11 vessels being delivered at intervals of nine months. The NT has also been identified as a likely forward operating base for the future MQ-4C Triton unmanned aerial vehicles. $46 million – upgrades to facilities at the Jindalee Operational Radar Network. A new ship lift facility is being developed at East Arm, which will position Darwin as the marine services hub for northern Australia. The NT Government will contribute up to $100 million towards the project to meet the needs of the general maritime sector and the current and long-term needs of the Department of Defence and the Australian Border Force. Expected to be operational by 2021, this facility will enable the maintenance and servicing of Defence and ABF vessels, along with commercial and private vessels, including from the oil, gas and marine industries. The project will include a ship lift facility for lifting vessels from the water for dry docking and maintenance works, and a common user area, available for ship repair and maintenance works. The project will have the capacity to lift vessels more than 90 meters in length, including the ADF’s new offshore patrol vessels. Land Development Corporation is also developing the Marine Industry Park which will establish an integrated marine services precinct that supports the Defence, oil and gas, coastal barging and logistics sectors. The Marine Service Area will accommodate major vessel maintenance workshops and supporting activities to compliment the Darwin ship lift facility. 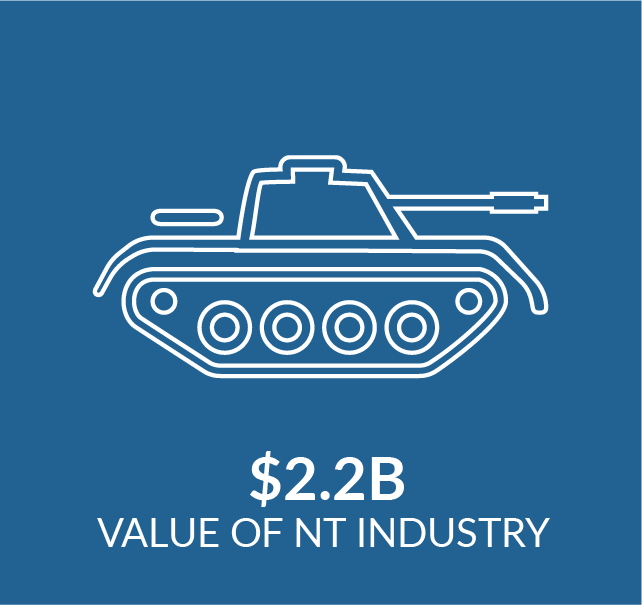 Defence is a significant contributor to the NT economy through the creation of direct and indirect employment, building of infrastructure and generating demand for local goods and services. The significant defence presence in the NT contributes to overall economic activity, primarily through direct investment in base and storage infrastructure, housing accommodation and training facilities. Defence also indirectly benefits the NT economy through increased visitor numbers and spending on local services in industries such as tourism, retail trade, culture and recreation, food and transport services. Defence personnel generally move into the NT on a minimum of a one‑year posting, thus substantially contributing to population turnover in the NT. Families moving with defence personnel also contribute economically to the NT community by adding to the pool of available employees. In 2017-18, there were 5,336 defence personnel based in the NT (including permanent personnel and reservists), of which 3,321 were in the army, 1,086 in the air force, 680 in the navy and 249 were Department of Defence civilians (Chart 3). The number of defence personnel located in the NT declined by 4.5% in 2017-18. This was the seventh consecutive year of decline since a peak of 7,234 people in 2009‑10 (Chart 3). The decline in the ADF workforce in 2017-18 was driven by a decrease in the permanent force (down 6.5% to 4,397 persons) as a result of a contraction in the army (down 7.6%). However the reserve forces increased by 11.5% to 690 persons during the same year. Consequently, the NT’s share of defence personnel slightly decreased from 5.7% in 2016-17 to 5.2% in 2017-18, continuing a downward trend since 2009-10. Defence’s contribution to the NT’s population is significantly broader than personnel directly employed, as a significant number of defence force personnel arriving in the NT also bring with them spouses and children. It is estimated that the NT’s total defence population (including personnel and their families) is approximately 12,000 people. The defence community directly contributes to the economic and social development of the region. Further, the number of US Marines arriving in the NT as part of the Joint Australia‑US Force Posture Initiative have increased significantly since the primary rotation, which are not included in the total defence force personnel data. All three ADF services (army, navy and airforce) have multiple northern Australia bases. The army operates from Larrakeyah Barracks and Robertson Barracks; the navy is based at HMAS Coonawarra; and the air force has RAAF bases Darwin and Tindal in the NT. Two of the army’s three multi-role combat brigades are based in northern Australia, with the 1st Brigade predominantly located at Robertson Barracks. The army also operates three Regional Force Surveillance Units in northern Australia, with one of the three being the North-West Mobile Force (NORFORCE) based at Darwin’s Larrakeyah Barracks. Its area of operation covers 1.8 million square kilometers and encompasses the NT and the Kimberley region of Western Australia, and is one of the largest area of any military units in the world. 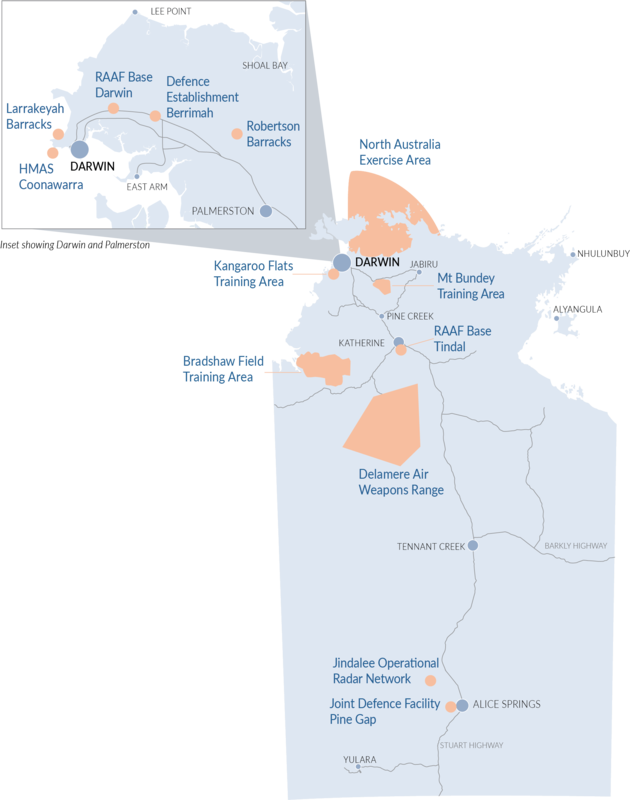 Other major defence sites in the NT include the Defence Establishment Berrimah in Darwin, which comprises accommodation and living facilities for defence personnel stationed in Darwin, the Joint Defence Facility Pine Gap near Alice Springs, which provides detailed geolocation intelligence to the US military, and the Multi-User Barge Ramp at East Arm, which provides logistics support to the ADF and a strategic interface between land and sea for up to 60 days per year. In addition, the NT hosts expansive training areas including the Bradshaw field training area (near Timber Creek), Kangaroo Flats training area (near Berry Springs), Mount Bundey field training area (south-east of Darwin), Delamere air weapons range (near Katherine), and the north Australia exercise area (located off the coast of Darwin and adjacent air space). The presence of the US Marines across the NT plays a vital role in underwriting security and stability across the Indo-Pacific, and the Force Posture initiatives are an essential component in preserving stability and security over the coming decades. The Force Posture initiatives also demonstrate the importance of the NT as a strategic location for regional security. First announced in 2011, the initiatives in Australia currently involve two key elements: annual six-monthly rotational deployment of US Marines, and a program of Enhanced Aircraft Cooperation activities. These rotations see US Marines at Robertson Barracks for six months each year, around April to September, to conduct joint military exercises and training with the ADF. The 2018 rotation was a milestone for the initiatives, demonstrating the ongoing commitment Australia and the US have to achieving the objectives of the Force Posture initiatives, with the largest annual participation on record. The 2018 rotation commenced in March 2018 and involved around 1,600 US Marines, with a robust ground combat element, a combat logistics detachment, an air combat element, as well as an enhanced command element directed by a Colonel. During the six-month rotation, the US Marines undertook several joint exercises and activities with the ADF across northern Australia, which provided an opportunity to interact and strengthen allies with a range of countries including Japan, Malaysia, the Philippines, Singapore, and Thailand. The enhanced aircraft cooperation initiative involves an extension of long-standing bilateral activities, building on US Marine visits for exercising and training. This initiative is an important element of the Australia-US alliance and is an expression of Australia’s support for a strong US presence in the Asia-Pacific region and a common interest in promoting regional security and stability. The 2018 Enhanced Air Cooperation activities continued to build on the programs from 2017, with a focus on air interoperability, platform integration and combined air responses, involving defence assets USAF B-52 Strategic Bombers, RAAF C-17 Globemaster, and USAF F22 Raptors. The 2019 rotation will continue to enhance the Australia-US partnership and strengthen both countries’ response capabilities as well as increase the training and engagement opportunities with regional partners. For more information on Defence initiatives and community engagement, visit the Australian Government’s Department of Defence website. The NT often hosts Australian and joint international defence force training exercises, aimed to strengthen defence postures and capabilities. Exercise Pitch Black is one of the largest air force training exercises in the southern hemisphere and is held every two years in Australia. During 27 July to 17 August 2018, the exercise was undertaken at RAAF Tindal and RAAF Darwin, and was aimed at improving the combat readiness and the cooperation of air forces, as well as to strengthen the ongoing military relationships between the countries involved. The exercise typically hosts up to 4,000 personnel and over 140 aircraft from around the globe including participants from Australia, Canada, France (New Caledonia), Germany, Indonesia, Netherlands, New Zealand, Singapore, Thailand and the United States, and included day and night flying exercises. The NT also continues to play a significant role supporting Operation RESOLUTE, including hosting Armidale‑class patrol boats, which are based at HMAS Coonawarra in Darwin. The operation focuses on maritime security threats including illegal maritime arrivals, people smuggling and terrorism; piracy, robbery and violence at sea; illegal fishing; compromise to bio-security; and protection of offshore oil and gas installations. For more information, please refer to the strategy available on the NT Department of Business, Trade and Innovation's website. The NT Government appointed a former senior Air Vice Marshal, Margaret Staib as the NT’s first Defence and National Security Advocate in June 2017. Ms Staib is the Chair of the NT Strategic Defence Advisory Board, which comprises leading Defence and industry experts to assist the NT increase engagement with defence and national security agencies. Ms Staib’s role will be to position the NT to benefit from $20 billion of Defence construction projects which are planned for the NT over the next 20 years and to maximise opportunities from other Defence investments. In 2017-18, Defence Housing Australia (DHA) managed 1,1,921 properties in the NT, reflecting a 1.3% decline compared to the previous year. This was below the 10‑year average number of properties in the NT of 2,347 (Chart 4). The NT comprised about 10.4% of the total number of DHA properties across Australia. Of the properties in the NT, about 81.4% were located in Darwin, with the remainder in Tindal and Alice Springs. As well as managing houses, DHA also managed a number of townhouses and high-rise apartments located within close proximity to Darwin city. Properties in the region accommodated members working at a number of ADF bases and establishments, including RAAF Base Darwin, Larrakeyah Barracks and RAAF Base Tindal. DHA is also continuing to make significant investments in its existing defence dwelling stock across Australia. DHA committed to a $300 million program to upgrade and replace on-base housing to meet the minimum housing standard required by defence. While improving the properties to provide a better standard of living for ADF members and their families, the upgrade program will also extend the life-span of these homes by 10 to 15 years. In June 2017, DHA completed upgrades to about 20 houses in Alice Springs and 29 houses in Katherine. For more information on defence housing and accommodation, please refer to the Defence Housing Australia website. As part of the NT Government’s Economic Development Framework, Defence was identified as one of the NT sectors expected to experience strong demand growth over the short to medium-term with a growing presence and committed national investment, which is likely to influence private sector investment and employment opportunities in the NT. Through the Economic Summits process, the NT Government together with key stakeholders and industries identified main determinants and high level actions to strengthen and maintain a robust defence presence in the NT and improve on defence services provided. For more information on the NT’s key growth sectors, please refer to the NT Government Economic Development Framework website. The Australian Bureau of Statistics (ABS) does not classify defence as a separate industry for reporting purposes in the national accounts, however it is reported against a number of industries and is predominantly included in the ‘public administration and safety’ industry. Defence personnel numbers are also excluded from the ABS labour force statistics, for reporting purposes. References to defence refer to the Department of Defence and the Australian Defence Force (ADF), collectively. Data for defence personnel and housing is sourced from the Department of Defence and the Defence Housing Authority (DHA) annual reports. DefenceNT also provides useful information and sources to Defence and related industry. DefenceNT is an advocate for the NT Government, which works to support defence, the defence community, and businesses and industries that support defence, and aims to provide opportunities and increase industry engagement, business development and employment in the NT. A representative of the unit is also located in Canberra.